Submitted by Jules on Fri, 13/04/2012 - 11:24. Jules (also known as Julie CJ) is co-owner of Lanzarote Information and she is the one who does all the hard work of finding information and posting it for our thousands of readers! She's lived in Lanzarote since the turn of the millennium and after successfully running businesses here for many years, she started the website in 2008, with the aim of providing the very best information about the island to tourists and residents alike. 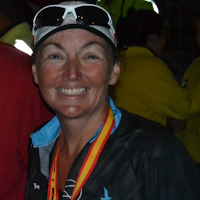 She's a keen gardener, loves walking and watching the wildlife in the Lanzarote countryside and is a budding triathlete, often to be seen swimming, running or cycling around the island. When it comes to Lanzarote, Jules is probably the best informed person on the planet with an encyclopedic knowledge of the island's history, current news and upcoming events.